SEIKO SK-2B Heavy Duty Walking Foot Machine with Reverse. 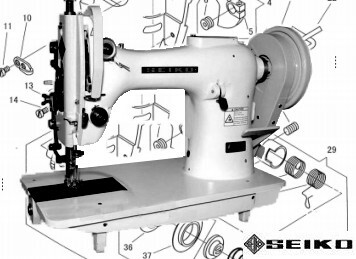 Based loosely around the SINGER 132K6 machine, this is a more advanced design incorporating a Reverse action. Used mainly in heavy applications like Harnesses, Tents and Slings. NEED PARTS For your SEIKO SK-2B SK-6 or SK-6F ? As these machines are 'Closely Related' to the SINGER 132K class we hold many Parts & Needles FROM STOCK. Can't find your Parts Or Unsure of What You Need ?